For just one day this Saturday, dance clubs will bring their explosive electronic/techno music to a massive outdoor stage on Hangang Nanji Park where more than 20,000 youngsters are expected to gather to party and dance. Global Gathering Korea 2011 will be held on Oct. 8, bringing in six DJing teams from overseas and 28 teams from Korea for a 900-minute dance party from 1 p.m. to 4 a.m. the next morning. The party is open only for those over 18, due to the sale of alcohol at the venue. German electronic punk duo Digitalism will be on stage, too. 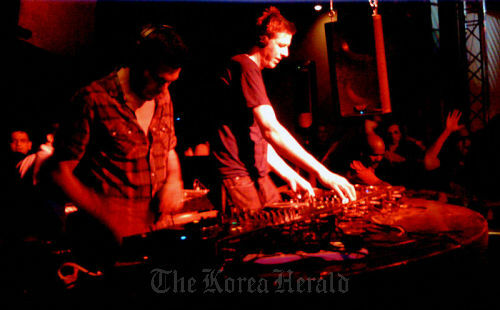 The duo has been sweeping international music festivals this year including Glastonbury Festival in the U.K., Summer Sonic Festival in Japan and Coachella Festival in the U.S.
Other participating overseas DJs include Yolanada be Cool, whose track “We No Speak Americano” was inserted in the party music of the MBC entertainment program “Infinite Challenge,” British producer and DJ Roni Size with his award-winning drum and bass sounds, London-based singer and rapper Example and Canadian dance music group MSTRKRFT’s member AL-P.
From Korea, one of the most interesting teams is Spyradio, led by actor and DJ Ryu Seung-bum. His girlfriend and actress Gong Hyo-jin is known for visiting Global Gathering events every year since it began in Korea in 2009. Other Korean DJs or rock bands performing at the festival include 360sounds, The Koxx, Mongoose, Glenchek, East Collective, Astro Voize, Bagagee Viphex12, Kingmck, MagicoToDisco and Limzi. This year, a majority of the audience members will be 20-something women. According to online ticket provider Interpark’s data as of Sept. 15, 63 percent of the ticket buyers were women. Among them, 77 percent were in their 20s, and 19 percent, in their 30s. “Among many local music festivals, Global Gathering has the most liberal atmosphere. The audience tends to freely make their own dance moves rather than doing a group dance,” an official at CJ E&M, which co-produces Global Gathering with VU Entertainment. Global Gathering Festival was established in 2001 in the U.K. featuring leading electronic musicians and has spread into other European countries, Russia and Korea in recent years. The festival came to Seoul in 2009. For the past two years, Korean fashion-savvy celebrities such as model and actress Kim Min-hee, K-pop idol group Big Bang member G-Dragon and actor Jung Woo-sung have attended the festival. Their presence helped spread the word that Global Gathering is loved by fashionistas in Korea. The organizer expected Global Gathering Korea 2011 to see a 20 percent increase in the number of visitors this year from 20,000 visitors last year. Online tickets are still available on websites of Mnet, Interpark, Auction, Yes24 and 1300K. Both online tickets and on-the-spot tickets are priced at 110,000 won. One person can purchase up to four tickets. For booking in English, contact info@vuent.co.kr. For more information, visit www.globalgatheringkorea.co.kr, or call (02) 323-2838.